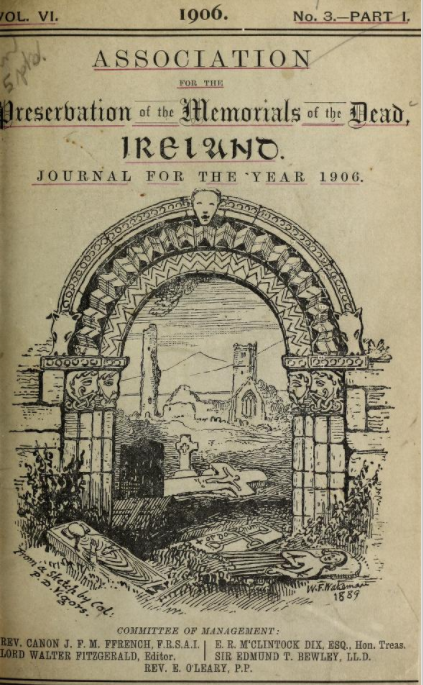 This publication was born out of Philip D. Vigors desire to preserve the tomb and headstone memorials that marked the place of burial of the Irish and record these in a printed volumes for posterity. Vigors enlisted the help of many willing participants from every county in Ireland to transcribe and record headstones in their locality that they would then send in for annual publication. The volumes were published from 1888 to 1934. The volume of transcriptions contain details of many early headstones that are now no longer readable. The volumes are as Vigors wrote, ‘a record of those who have gone before us’. These volumes are undoubtedly an invaluable resource for those who are carrying out family history research. An example of the utility of this source can be found in the publication of headstone and memorial inscriptions for St Columb's Cathedral Church of Ireland graveyard in the city of L'Derry. The survey seems remarkably complete and was originally attributed as the work of the Rev G Galbraith, Dean of Derry. But in a subsequent volume an apology was issued and a correction given that the transcriptions were the work of the Rev Richard Hailes, Dean of Derry 1911-1921.